Morn Man Shepherd Toasts "Who Mourns?" Ever since I was a child I’ve dreamed about what it would be like to travel to the stars. Imagined what it must be like to fly like Superman. Marveled at the potential of the human mind and admired the indelible dynamism of the human spirit. The ingenuity of great thinkers and the ability to overcome great obstacles and to achieve great things are for me like music for the soul. “To explore strange new worlds. To seek out new life and new civilizations. To boldly go where no man has gone before” meant more to me than just a suggestion. When I saw Captain Kirk or the pointy-eared Mr. Spock on the television screen I knew what it meant, all right. I was ready for an adventure to the stars on a great starship capable of traveling light distances at warp speed, and when it was over I was back in my living room somehow satisfied that I had experienced something. I’m not sure exactly what it was, but I knew I wanted more. 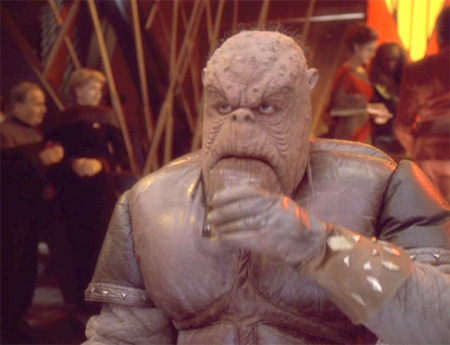 For me, playing Morn on Deep Space Nine was more than just a job. It was an opportunity to live that dream — and to somehow participate in the modern mythology that is Star Trek, which has become such an integral part of popular culture. “Who Morns for Morn?” is probably the best Morn episode ever. This is the back story on Morn that Deep Space Nine fans had been requesting for years. I look back on it and now I can laugh at it, but at that time the significance of that episode wasn’t as clear. When I first heard rumors about an episode in which Morn was going to die my first reaction was that my career on Star Trek was over. But as the weeks wore on I began to take these rumors in a different light. They were always changing from one day to the next. One day, they said Morn was going to speak and the next day they said that they wrote it out. Then they said Morn was going to die, and next they said that maybe he would only fake his death. So, I learned to take everything that people were talking about on the set with regards to “Who Mourns for Morn?” and other upcoming episodes with a grain of salt. I think after a while I even began to enjoy it. There are several other references in this episode that come directly from my relationships with cast, crew, writers and production people. I used to practice Tai chi chuan, a Chinese martial art, on the set in between shots that I was needed for. So, in “Who Mourns for Morn?” when Dax and Worf are talking, on their way to the memorial service for Morn, Worf says “Morn was an excellent sparring partner. I will miss our weekly combat in the holosuites,” it came from my practice of Tái Chi. Even the “Matador” painting that Morn had hanging in his quarters was somehow related to that. I think I told one of the writers or someone on the set that Tái chi chuan was like a matador in a bullfight by analogy. 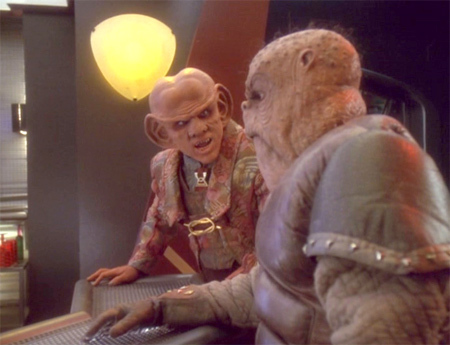 At the memorial service, Quark and Odo are talking and Quark says, “You know Morn had two stomachs to fill. Did you ever watch him eat? It was a beautiful thing.” That referred the fact that I had a difficult time eating anything like rice or any kind of sauce or crumbs, and so, when it came time for lunch I used to sit in front of a mirror to eat. With my left-hand forefinger and middle finger I would spread apart the lips of my mask and with my right hand guide the food into my mouth while watching this in one of the makeup station mirrors on the next stage – just so that the food would not touch the mask. If I got any kind of oil or grease from food on the mask, the mask would get damaged. I usually had at least one or two people that would stop for a moment or two to watch me doing this. Even with my best efforts, after lunch or dinner the makeup artists always had to spend a little extra time cleaning the area of the mask around the mouth with alcohol so that any residue or oil from food was cleaned away. 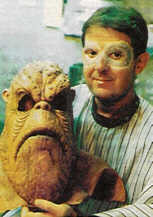 David Russell Quaschnick, my makeup artist probably more often than anyone else during the filming of Deep Space Nine, was my buddy and was always standing by on the set to do any touchups before actual filming of Morn. He also did the makeup for Morn in the mornings and… after meals, too. My favorite scenes to shoot for “Who Mourns for Mourn?” were the Morn Hologram and, of course, when Morn returns at the end. 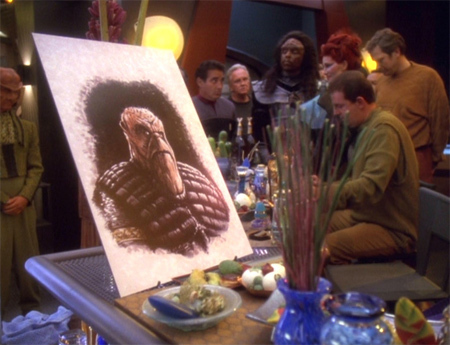 But I also appear out of makeup at the memorial service as the Bajoran civilian that Quark asks to sit in Morn´s seat “to keep it warm for Morn.” Ira Steven Behr told me it was an inside joke, but I think now just about everyone knows this. I spent even my days off watching the filming. Every chance I had to be on the set was an opportunity to study acting and filmmaking, which has always been a great passion of mine. 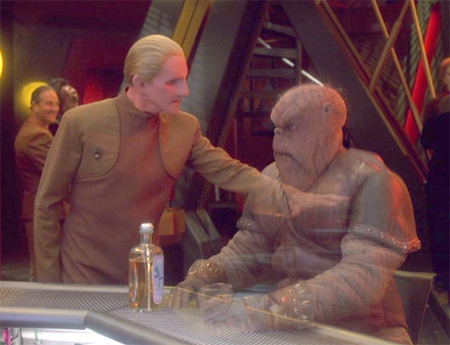 I wish to thank everyone who was involved in the writing and production of Deep Space Nine and “Who Mourns for Morn?” without whose support none of this would have happened. As Quark can attest, I could literally go on about all of this for hours, but I guess you´ll have to catch up with me again sometime, maybe at a convention; feel free to follow me on Twitter, Facebook and/or my site. As for the thousand bricks of gold pressed latinum… the rest is in the bank of Bolius, Account Number# CJ5 7436.